According to official and media accounts of crimes committed against Canadians, Quebeckers and Indigenous peoples by the Royal Canadian Mounted Police (RCMP), some crimes never took place and others were unacceptable aberrations. They say that, in any event, the door for such things to be repeated was closed in 1984, when the Canadian Security Intelligence Review Service (CSIS) was created to collect intelligence but not pass to action. 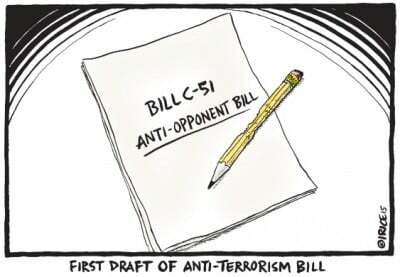 In this context, concern is expressed about Bill C-51, the Anti-Terrorism Act, 2015 extending powers to CSIS to allow it to conduct activities that resemble those of the RCMP prior to 1984. Of course, it is not true that after 1984 the security services stopped violating the rights of the people.Far from it, another national inquiry is required to reveal what the spy agencies have been up to since then, up to and including their cover-up of their involvement in the 1985 Air India disaster. Nonetheless, it is instructive to review the official story and what the Communist Party of Canada (Marxist-Leninist) had to say about this at the time the events were taking place. The aim of the review is to sum up this experience so that people can provide themselves with a suitable guide to action which serves the present and opens a path to a safe and bright future. As the official story goes, the RCMP carried out illegal activities until approximately 1977 as part of its work to safeguard Canadian “national security,” but all of this was cleaned up in the period from 1978 through 1984, culminating in the separation of the RCMP’s intelligence and enforcement wings, as recommended by the Commission of Inquiry Concerning Certain Activities of the RCMP (the McDonald Commission). From 1977 through to 1981 was the period of investigation into RCMP wrongdoings, while 1981 through 1984 was the period of reorganization of the security forces. The new regime was put in place in November 1984 with the appointment of the first Security Intelligence Review Committee. Arson attack on BC headquarters of CPC(M-L), August 12, 1983. On July 26, 1974, Robert Samson a former RCMP constable and member of the Combined Anti-Terrorist Squad of Quebec who had gone into the RCMP-Security Service (RCMP-SS) was injured by a bomb explosion in front of the Mount Royal home of Melvyn Dobrin, president of the Steinberg supermarket chain. Samson said he was meeting an informant at the location when he spotted and picked up a parcel, which exploded in his face. The RCMP officially disavowed any link to Samson’s activity and reported him to the Montreal police. The Quebec fire commissioner, who interrogated Samson. did not buy his story and he was charged with planting the bomb. During his court case, held in 1976, Samson spilled information about what he referred to as Operation Bricole. In exchange for immunity he explained that Operation Bricole involved a break-in at the Montreal office of Agence de Presse Libre du Québec (APLQ) “to take documents which were files of the most militant members as well as pertinent documents.” He explained that the APLQ “always had a fairly big list of Quebec leftists.” To this day, what Samson was actually doing on July 26, 1974 remains a mystery. At the same time, in June 1977, the Quebec government, headed by the Parti Québécois, decided to launch its own inquiry into the police activities, the Commission d’enquête sur des opérations policières en territoire québécois (also known as the Keable Commission). Every step of the way, the Commission met with resistance and obstruction from both the RCMP and the federal government who challenged the Commission’s jurisdiction to examine the affairs of a federal agency, arguing that it was invading the prerogatives of the federal government. The Trudeau government succeeded in having Canadian courts declare the investigation unconstitutional, even though a large number of the dirty operations were directed against the people of Quebec. It charged that the Keable Commission would be violating the Official Secrets Act. Solicitor General Francis Fox, who succeeded Allmand, refused to hand over subpoenaed documents, using the “absolute privilege” accorded to the Solicitor General under Canada’s Federal Courts Act, a privilege without any recourse to appeal. The issuing of 13 false FLQ press releases in 1971 from a dummy FLQ cell called André Ouimet, which claimed responsibility for the firebombing of the Brinks Company office in Montreal in January of the same year. The purpose of the communiqués was to create the impression that the FLQ was still active after the October Crisis of 1970. Some of them threatened the life of Minister of Justice Jérôme Choquette and claimed responsibility for firebombings that never took place. The media, especially the Journal de Montréal, published stories on the basis of those communiqués with titles such as “The FLQ Is Not Dead” and “Have We Underestimated the Strength of the FLQ?” The FLQ which for all intents and purposes was decimated during the October Crisis, was now presented as a powerful organization with numerous cells whose frequent actions “represent an active threat to the security of the person and to civil liberties in Quebec.” The Keable Commission dedicated a chapter to the role of the media in these intrigues. The kidnapping of André Chamard, a law intern involved in the defence of the accused FLQ members on June 7, 1972. The RCMP first attempted to recruit Chamard as an informer using a drug case he was involved in as blackmail and subjected him to beatings and death threats. The theft of Parti Québécois membership lists in January 1973 during “Operation Ham,” as part of a burglary of the courier company “Courier Dynamics Inc,” an operation involving 66 RCMP officers. RCMP Officer Donald Cobb, Inspector Jean Coutellier of the Sûreté du Québec and Inspector Roger Cormier of the Montreal police were eventually charged with authorizing a search without a warrant in relation to the APLQ break-in. The proceedings carried on until June 1977 when they pleaded guilty, eliminating public hearing of evidence. Their lawyer argued that they were outstanding citizens, that they had a momentary lapse when they failed to obtain a warrant and that they had done it with the best of motives – to defend national security. They were granted unconditional discharges and returned to active duty. On July 6, 1977, Solicitor General Fox acknowledged in the House of Commons that the APLQ break-in was not an “exceptional and isolated” case and announced that a Commission of Inquiry would be launched. The McDonald Commission began its hearings on October 18, 1977. All told there were 169 hearings, 144 of them held in camera. It heard evidence from 149 witnesses about RCMP activities and the extent of knowledge about them by Ministers and senior officials. Fifty-two volumes of transcripts heard in camera were released as 45 volumes of redacted material. Some of this is now in the National Archives, which can be accessed with CSIS approval. Once cleared for access, documents can be viewed by others. Much, if not most, of the evidence pertaining to this period right through to 1988 has been destroyed. According to what the RCMP-SS told the Commission, the files were destroyed after two internal reviews, one in 1974-75, referred to as “Phase One” involving “mere proposals for operations” – and the remainder in 1977. There were “approximately 25 volumes” related to Operation Checkmate in total. 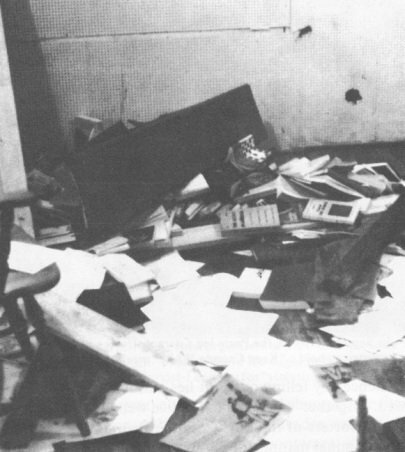 The Commission reported that the officers involved in the destruction of files discussed “the potentially ‘very explosive’ nature of what little material was still on the files.” The Commission said no explanation was given as to what “very explosive” meant, or whether the “problems involved possible illegalities.” No list of the materials destroyed was kept. The Commission concluded: “In our opinion the explanation given by Mr. Yaworski for recommending in 1974 the destruction of the Checkmate files, when analyzed, amounts to nothing less than an intention to reduce the possibility of the Government of Canada learning of acts which he himself had come to consider to have been ‘wrong.’ Standard criteria for the destruction of files were deliberately disregarded by him and Mr. Draper. “We cannot ignore the fact that more than three years earlier, on June 30, 1971, in a memorandum prepared by Mr. Yaworski (although signed by Sergeant Pethic), it was said that ‘containment measures being considered or attempted’ might be ‘of such a sensitive nature that they are not to be committed to paper.’ Mr. Yaworski told us that by ‘sensitive’ he did not mean ‘illegal’ but rather the fact that the Security Service was using information from a source which might put the source in jeopardy, and to the fact that the Security Service was itself taking action rather than simply reporting its information to some other branch of government. On February 19, 1975, the Communist Party of Canada (Marxist-Leninist) convened a press conference in Toronto to repudiate a sensationalist news item in the Toronto Star claiming that an FBI agent named Joseph Burton had infiltrated the Party and gathered internal information. In a statement issued at the time, the Party said: “This manoeuver on the part of the capitalist press was so clumsy that it showed their sinister motive to discredit the Party by raising doubts about [its] operations and causing suspicion in the minds of the people about [its] integrity.” The alleged infiltrator claimed that he knew that “Hardial Bains walked out of the North Korean embassy in Paris with $30,000” when such an embassy did not even exist. This activity was one of many carried out against CPC(M-L). It was neither the first dirty operation carried out against the Party by the RCMP-SS nor was it the last. The day will certainly come when the peoples of Canada will reconstruct the truth about the sordid treacherous activities carried out against them in the period that has supposedly been investigated and dealt with. But the biggest fraud of all is that CSIS gave rise to a “new” civilian agency to take care of national security intelligence. In fact, any RCMP-SS members who wished to do so were welcomed to join CSIS. It is said that many even kept their desks and that the new spy agency primarily consisted of former RCMP-SS members. In the period of transition to CSIS, on August 12, 1984, the British Columbia Headquarters of CPC(M-L) was burned to the ground along with surrounding businesses, with total damages estimated at $3 million. It was as though CSIS was sending a message that nothing was going to change. A 22-year-old American citizen named Rolland Degroot was detained in connection with the fire, but the police and the media refused to properly investigate the matter so that nobody would be charged and there was to be no redress. 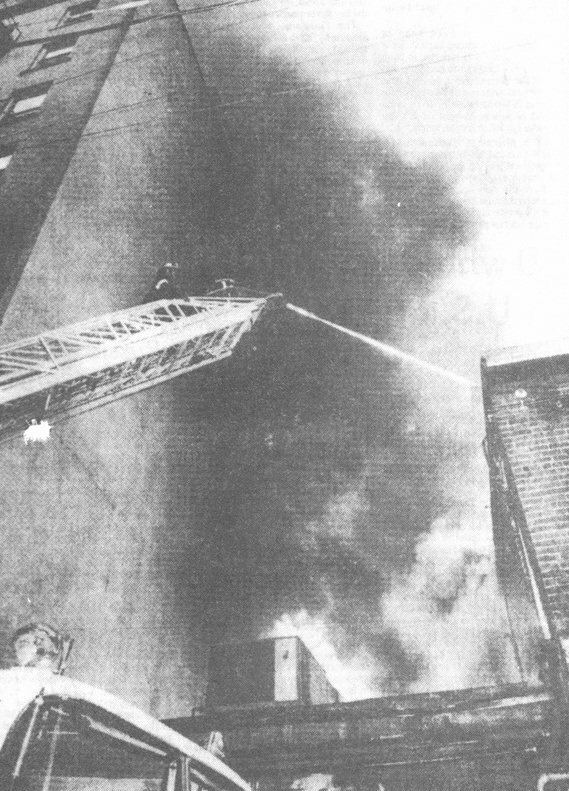 In the days and weeks prior to the razing of the Party’s BC Headquarters, various other attacks were carried out, not only on the BC Headquarters, but in Montreal as well. Degroot was a self-proclaimed neo-Nazi, who the police never charged or brought to justice. The attack was part of the state’s racist offensive against the people of British Columbia and across the country to terrorize immigrants and get them to stop fighting for their rights. The state floated Nazi and white supremacist organizations which it used to launch racist attacks. It tried to blame the people for being racist, as it does today in the case of accusations that Quebeckers are Islamophobic or that Canadians demand that Muslims be “moderate” and swear loyalty to what are called Canadian values. All of this propaganda served to justify using state intervention against the people in both Canada and India just as today it is used in a similar manner at home and abroad. During the period when these attacks were being launched, CPC(M-L) and its leader Hardial Bains raised the slogan to blame the state and not the people for racist attacks and fascist violence and called on the people to organize their own defence, since clearly the police were not going to defend them. The East Indian Defence Committee was founded in 1975 and then, in November 1980, the People’s Front Against Racist and Fascist Violence was founded. Both organizations developed their work under the leadership of the Party and Hardial Bains. It brought organized form to work that had been carried out from early 1973 to unite the people of all walks of life and backgrounds in action to oppose the racist and fascist violence and make sure it would not take hold in Canada. Hundreds of thousands of Canadians joined in mass opposition to the racist and fascist violence, including to the racist Green Paper on Immigration released by the Liberal government in 1975, a struggle the Party also led. The Green Paper divided Canadians between whites and “people of colour with novel and distinctive features” and enshrined the category Aboriginal to make sure all the Indigenous nations were lumped together on a racist basis. Following the Green Paper, as the recognition of state-organized racism took hold in the Canadian consciousness, Ontario issued the Walter Pitman Report which declared that there was no evidence of state-organized racism and that Canadians “are all a little bit racist.” This entire period laid bare the hand of the state behind racist and fascist violence. It clearly established the truth of what CPC(M-L) was saying. Because of this, the state did everything possible to isolate CPC(M-L), including staging attacks against it by police agents within the people’s movement and then blaming CPC(M-L) for instigating violence when it defended itself against these assaults. CPC(M-L) was vindicated in court where the preponderance of evidence showed that it was the target of assaults and that it assaulted no one even when it defended itself against assault. Later, the Canadian state stepped up its use of state terrorism against the people. Amongst other things, it concocted the theory of “Sikh fundamentalism” and “extremists” to justify the state attacks against those who were opposing injustice in Canada and in India, taking a stand against the Indira Gandhi regime, especially those from the Punjab nation seeking independence from India. Criminal attacks were also launched against the people of Kashmir and the other nations and tribal peoples in India fighting for emancipation and the brutal oppression and exploitation at the hands of the industrialists, landlords and their state. The Air India bombing took place under these conditions and no amount of attempts to blame it on “Sikh extremists” could hide the hand of the Canadian spy agencies in creating these “extremists” and putting together this conspiracy. Under these conditions, thousands of Punjabi youth were slaughtered in Punjab, while black laws and black ops were used to suppress the opposition. Finally, the floodgates to the perpetuation of anarchy and violence in India saw Operation Blue Star in 1984 when the Golden Temple in Amritsar, Punjab, the holiest shrine of the Sikhs, was invaded by the Indian army which caused many people to be slaughtered. This opened the floodgates of state intervention in religious affairs where it dictates the conscience of the people and what they can and cannot do as a way of life. The policy of individual acts of terrorism and targeted assassinations became commonplace with the aim of keeping people out of politics. Indira Gandhi and her son Rajiv Gandhi themselves fell victim to this policy. Thus the Canadian state erected the bogeyman of “Sikh fundamentalism.” Following the 9/11 attacks against the twin towers in New York and the Pentagon in Washington, D.C., this turned out to be yeoman’s service for the imperialist system of states. This “Sikh fundamentalism” served as a model for the CIA as it erected the spectre of “Islamic fundamentalism” as the extreme which poses the gravest danger to society. On this basis, once again, it is the people who are blamed for the terrorist attacks while state terrorism in the name of combatting terror is erected as the solution. All of it reveals the modus operandi of the so-called intelligence services and their “strategy of tension” which, in turn, has the aim of making sure economic, social and other problems are not provided with political solutions. Throughout all this period, the work to unite the people in action against the state-organized racist and fascist attacks proved the revolutionary character and mettle of CPC(M-L). 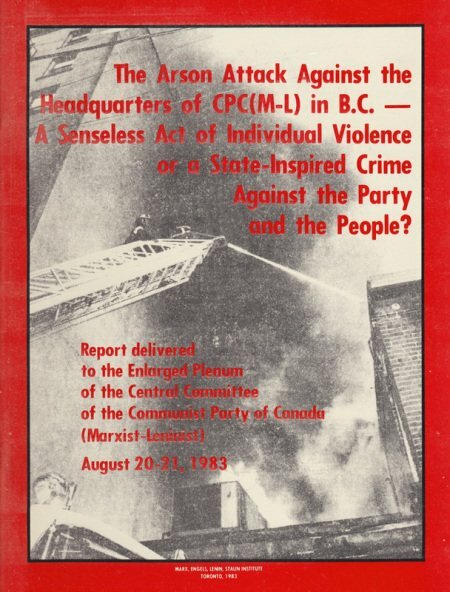 After the arson attack on its BC Headquarters, on August 20-21, 1983, the Party convened an Enlarged Plenum of the Central Committee where a report was presented entitled “The Arson Attack Against the Headquarters of CPC(M-L) in BC – A Senseless Act of Individual Violence or a State-Inspired Crime Against the Party and the People?” The Party put the arson attack in the context of the long line of attacks of various forms that were launched against the Party, its members, supporters and offices from 1970 through to the arson attack. to promote the bankrupt anti-communist theory of “two extremes,” according to which the Marxist-Leninists and the fascists are fighting each other while the government and state agencies are the middle-ground opposed to each. Within this context, the Plenum analyzed that the measures were being put in place to strengthen the repressive state apparatus as part of the all-round fascization of life, the suppression of the Marxist-Leninists and other progressive forces and “to incite crimes of so-called senseless violence” such as the arson attack in BC. Police attack demonstration led by CPC(M-L) activists outside the Royal York Hotel in Toronto, on March 3, 1971. The demonstration was in support of the Quebec people and against the attacks launched on them by Prime Minister Pierre Trudeau. The Central Committee posed the question: “Who are the terrorists and who is carrying out acts of political violence in Canada?” To answer the question, it looked to the McDonald Commission’s report. “The McDonald Commission report also served to justify the fascization of the state and strengthening of the apparatus of repression, including the operation of the civilian spy agency, CSIS, under the guise that it is necessary to make illegal activities legal in the name of the interests of national security, in the name that Canada’s interests are inseparable from those of U.S. imperialism and that those who fight for the democratic rights of the people and the interests of the nation … are the ‘enemies’ of the interests of the people and the nation and are the source of the danger to peace and security in Canada and to democracy. The Report to the Plenum pointed out that “In the category of ‘groups working actively to overthrow the foundation of parliamentary democracy’ the Commission lumps the Marxist-Leninists together with the fascists so as to create maximum confusion, and then declares that the fascists are inactive and do not pose a threat.” The report pointed out that it was not accidental that the Commission did not make more specific the category of “terrorist organizations.” It was already documented that the RCMP and other police forces were behind all the terrorist activities they blamed on the FLQ, to say nothing about the “Western Guard” and other neo-Nazi, white supremacist organizations that had committed terrorist attacks. “The McDonald Commission even records certain of these attacks, as well as the work of the U.S. police agents operating in Canada, and condones these nefarious activities,” the Report pointed out. The Report concluded that the creation of CSIS “… is a further step in the fascization of the state within the framework of the so-called parliamentary process and through ‘constitutional means’ and it poses a real threat to the lives and liberties of the people.” Amongst other things it noted that the legislation would grant immunity for security service operatives and make it a criminal offense for anyone to reveal their identity. The Report also identified the alleged fight against terrorism as “an important propaganda weapon for the ideo-political deception” of the people with the aim of liquidating and diverting their struggles. To come: A summary of the proceedings of the August 1983 Enlarged Plenum of the Central Committee of CPC(M-L) which enumerated many of the black ops against the Party and analyzed important national and international developments at the time that are important to revisit as the Harper government pushes Canada further along a retrogressive and dangerous course. Report of the Keable Commission, Wikipedia. Spying 101: the RCMP’s Secret Activities at Canadian Universities, 1917-1997, Steve Hewitt, (Toronto: University of Toronto Press, c2002). Third Report: Certain R.C.M.P. Activities and the Question of Governmental Knowledge (1981).Commission of Inquiry Concerning Certain Activities of the Royal Canadian Mounted Police, Chair, Mr. Justice D.C. McDonald. The Arson Attack Against the Headquarters of CPC(M-L) in B.C. – A Senseless Act of Individual Violence or a State-Inspired Crime Against the Party and the People, Report Delivered to the Enlarged Plenum of the Central Committee of the Communist Party of Canada (Marxist-Leninist), August 20-21, 1983, (MELS 1983). Secret Service: Political Policing in Canada from the Fenians to Fortress America. Reg Whitaker, Gregory S. Kealey, and Andrew Parnaby (Toronto: University of Toronto Press, 2012).